Welcome to Bear Crossing in Pigeon Forge! 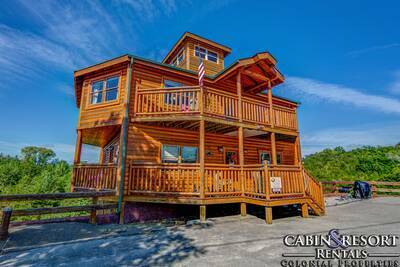 This absolutely breathtaking 3 bedroom, 3 bath Smoky Mountain cabin rental is definitely an amazing place to spend your next vacation adventure! On your drive to Bear Crossing, you’ll love meandering across the beautiful covered bridge, passing by the fishing pond and ending at this stunning cabin rental. 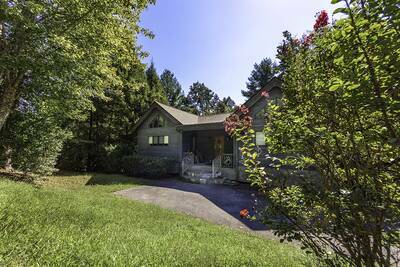 As soon as you open the door, you enter the spacious living area adorned with large windows looking out into the forest, cathedral ceilings with exposed beams, stone accented fireplace, comfy furnishings, flat screen TV and access onto the expansive deck. Adjacent to the living room is the fully equipped kitchen with bar area– offering everything you’ll need to prepare a delicious meal while you’re in the Smokies. Adjoining the kitchen is the log furnished dining/breakfast area. Located off of the kitchen/dining area is access to the screened porch - a perfect spot to enjoy your dinner, morning coffee or just a relaxing evening in the mountains. Also located on the main level is the ultra luxurious master suite. This breathtaking king bedroom features a romantic fireplace, cathedral ceiling, deck access and a spa-like bath with custom tile, copper sink and a large jetted tub. Take a walk downstairs and enter the huge game room featuring a beautiful, red accented pool table. It’s a great gathering spot and entertaining area for all of your family and friends. The lower level also features two split bedrooms from the game room, both of which have their own deck access. One is an additional king bedroom with in-suite full bath and jetted tub. The other is a queen bedroom with in-suite full bath as well. When you’re ready to spend some time outdoors, then you’ll love staying at Bear Crossing. With two levels (upper and lower) of covered decks, you’ll have more than enough space to listen to the birds chirping, the breeze moving through the trees and the quietness of the Smoky Mountains. The main level deck offers rocking chairs, patio style furnishings and a relaxing glider. The lower level deck is where you’ll find the toasty outdoor hot tub and additional rocking chairs. Bear Crossing is located in a luxurious cabin community. With seasonal outdoor swimming pool access, fishing pond, large covered pavilion, on-site chapel and many other great amenities, you may never want to leave! In the event that you need to check in with the office, do a little work or just want to browse the web, there’s also complimentary high speed internet access. Bear Crossing is also a pet-friendly cabin rental. Please review and be familiar with our pet policies if you plan on bringing your furry friend! 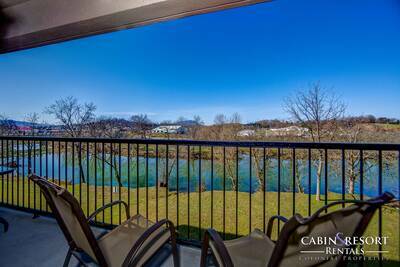 With all of these wonderful amenities, luxurious features and beautiful Pigeon Forge location, your stay at Bear Crossing will definitely be remarkable. Don’t miss out and reserve your upcoming stay today! A: Hi Sherry! Bear Crossing has a 2 pet maximum. A: Hi Sarah! Bear Crossing is located within Cedar Falls Resort. There will be other cabins in the area. A: Hi Gwen! 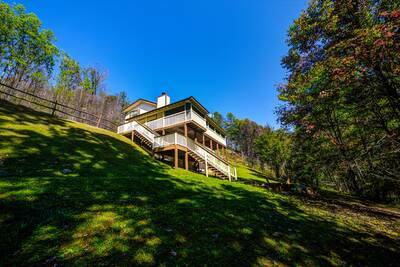 Bear Crossing is located in Cedar Falls Resort which located off of Wears Valley Road. A: Hi Keith! Bear Crossing is located in Cedar Falls Resort. 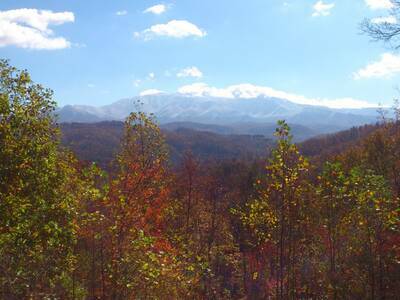 The Resort is not on a mountainous road and is approximately 15 - 20 minutes from Pigeon Forge. A: Yes, WiFi is provided at Bear Crossing. “ We loved the cabin. Had a great time. Very quiet location. Beautiful area. Would love to go back and take my whole family. “ Great place for the family to a spend time with each other and to have fun together. “ Cabin was very nice. We really enjoyed the atmosphere & our stay. 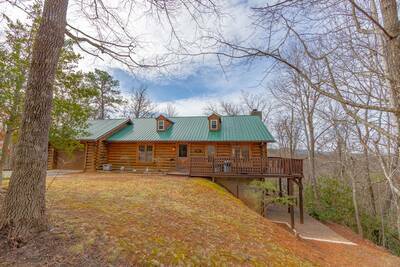 We would recommend this cabin to anyone coming to the Smoky Mountains. “ Our stay at Bear Crossing was very nice. It was 3 couples and we had lots of room. We went to Cades Cove seen LOTS of bears, deer, turkey and coyotes. “ Very nice, peaceful and quiet! Recommend to anyone! “ We really enjoyed our vacation. The Colonial Properties staff were very friendly. The cabin was very comfortable and we will definitely use Colonial Properties for our next vacation to the Smoky's! “ Colonial Properties staff was very easy to work with and the prices were reasonable. The cabin was beautiful and just as it looked on the internet. I would definitely encourage everyone to book with Colonial Properties. “ We had a terrific time in the cabin!!! Enough space for our family!! The cabin was just far enough from the hustle of the strip, easy to get too!!! We will be staying again!! Thank you colonial properties!! “ It was very quiet and beautiful surroundings. We took a walk and it was nice. We came to the area to relax and we did!! “ We had a wonderful vacation - it was so relaxing. When we came back from Cades Cove a turkey was walking across the front yard! The harvest decorations really got us in the mood to decorate our homes. We took our 90 year old mom and she is still talking about how much fun she had. She hasn't been into decorating for Christmas the past few years, but all that has changed since going to the Christmas shop at Apple Farm. Thank you we had a great time! “ We enjoyed our vacation stay at this cabin. There was plenty of room for my grandchildren to play and not be cooped up. Location was wonderful. I am glad we could take our dog with us. “ We has a wonderful time in the mountains! The cabin was absolutely beautiful!! The people at Colonial Properties were great! I would recommend staying here! “ Bear Crossing Cabin a the Colonial Properties staff was great. We would recommend this company when booking a vacation to anybody. Bear Crossing even to be pet friendly was extremely clean that you couldn't tell pets have stayed there. The cabin was easy to get to and only 15 mins from the parkway. Plenty of room for a family of 7. We loved this cabin a will be booking it again for next summer. Thank you Colonial Properties and the owners of this cabin.